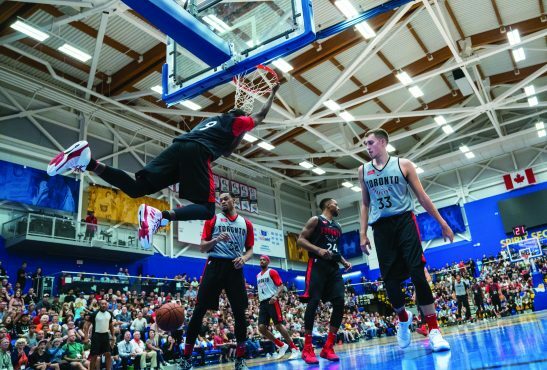 The average height on campus jumped significantly on Sept. 26 when the Toronto Raptors arrived to hold their training camp at UVic. The team ran its pre-preseason practices in the CARSA facility until the 29th and hosted an intrasquad exhibition game on the 28th — only the fifth time B.C. has seen NBA action (competitive or otherwise) since the departure of the Vancouver Grizzlies in 2001. 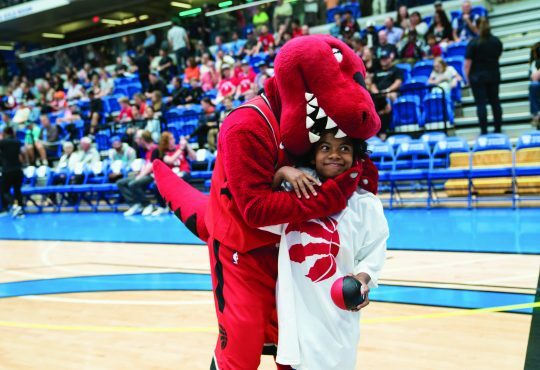 In front of a sellout crowd of 2‌ 700, the Raptors Black team — led by recently re-signed star point guard Kyle Lowry and wing Norman Powell — defeated the Raptors White team — starring shooting guard Demar Derozan and center Jonas Valanciunas — by a score of 89 to 63. The game gave fans the unveiling of Toronto’s new “culture reset” following their second straight playoff defeat by LeBron James, with the team shifting away from isolation scoring by its stars and toward more movement and long-distance scoring by the full roster. Both sides attempted more three-point throws in the shortened 40-minute scrimmage than the Raptors averaged last season in their full 48-minute games, and 46 per cent of their total shots came from beyond the arc versus only 29 per cent in 2016–17. 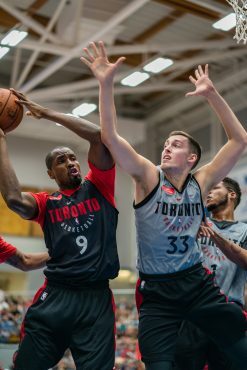 Leading this three-point barrage were Canadian national team sharpshooters Kyle Wiltjer and Andy Rautins, who are among the players competing for the Raptors’ final two roster spots. Wiltjer scored 17 points on 5/9 shooting from three, while Rautins put up 12 points on 4/6. Both are second-generation Team Canadians: Wiltjer’s father Greg played in the 1984 Olympics, and Rautins is the son of former Team Canada player and later head coach Leo Rautins (currently a Raptors broadcaster). 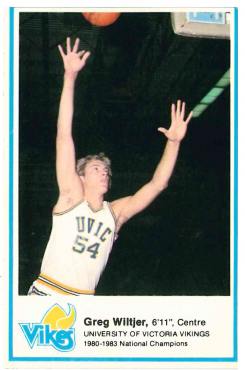 Greg Wiltjer was also raised on the Island and played for the UVic Vikes, winning a national title in 1984. With the Grizzlies long gone, the Raptors franchise has positioned itself as Canada’s team through the “We The North” campaign launched during the first Lowry-era playoff run in 2014 and the Canada Series of preseason games played in the country’s major cities. The significance of representing a whole country’s fan base was also felt by the Raptors’ main summer import, three-point specialist CJ Miles. “I’ve been in smaller market teams, and it’s crazy when you come somewhere where you’re the only team in the nation and [popular in] every part of it,” Miles told the Martlet at the team’s final Victoria practice. Most B.C. basketball fans have been starved for pro hoops since loss of the Grizzlies and then the Seattle Supersonics in 2001 and 2008 respectively. 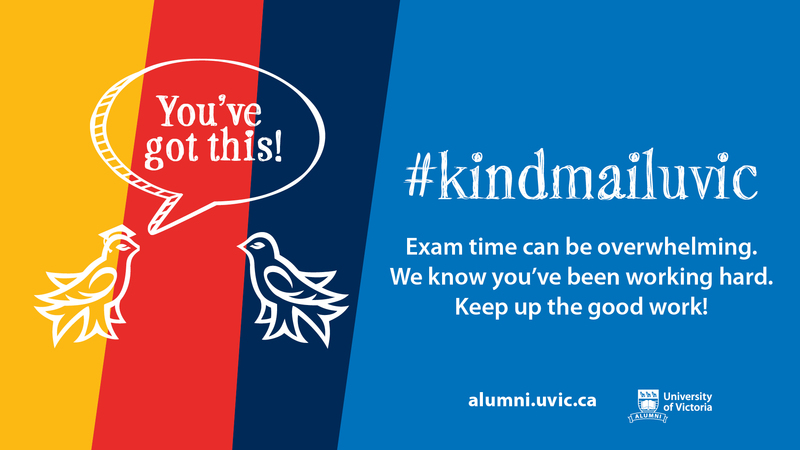 But Victorians maintained a connection to the league through the career of local product Steve Nash, the 2005 and 2006 NBA MVP and current general manager of Canada Basketball whose name adorns gyms and basketball courts across town. With all but five members of Toronto’s roster in their first four NBA seasons, being a university player was a recent experience for many of the players themselves, and being on campus brought those memories back. The campus was especially nostalgic for Wiltjer, a dual citizen who grew up in Beaverton, Oregon and often visited the Island. The past six years have sent Wiltjer all over the map: southeast to powerhouse Kentucky University, where he won the NCAA championship; back up here to Spokane’s Gonzaga University; south to the Houston Rockets for a year; west to the Clippers for two weeks; and then northeast after being picked up on a non-guaranteed deal by Toronto in August. Joining the Raptors in this exact year has brought him, serendipitously, back here to the place his father starred. “I was on the phone with him last night and he said it was like déjà vu seeing me here,” said Wiltjer whose grandfather still lives in Duncan. Wiltjer won’t be the only player returning to the island in the future — the city’s four days of mostly perfect fall weathehr charmed some of the newcomers as well, despite their stay being mostly confined to the gym and hotel. 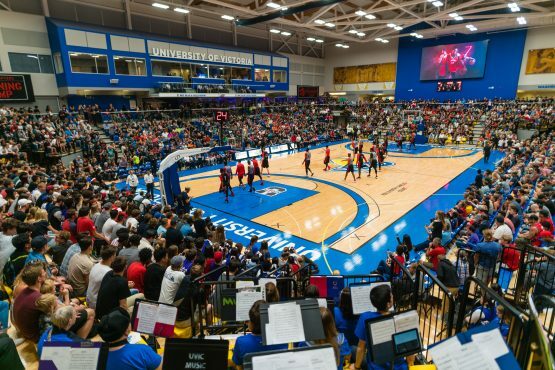 Until the Raptors return, the Vikes are happy to satisfy the city’s desire for live basketball.